Bears and some bulls no doubt continue to stare in disbelief at the extent of this rally. But given a downleg will have to occur at some point in the near future what will bulls have to look out for to keep the buyer-train intact? There have been various technical patterns touted as possibilities but it has been hard to put a clear fit on any. 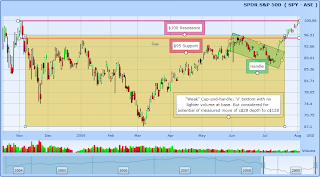 Once the S&P ETF cracked through $95 trying to fit a head-and-shoulder pattern with a right-shoulder low of $87.35 doesn't mesh well with a left-shoulder low of $74.34 (shoulders should be approximately equal, or at least mirror a relationship to the angle of the neckline which in this case is flat). An alternative is the cup-and-handle pattern. The shallower downleg from June representing the 'handle' from the prior base. The issue here is the "V"-shape of the base and the poor volume characteristics of the pattern. Strong cup-and-handle patterns have a "U"-style bottom on light volume; with volume building as the right-hand-side of the pattern completes. The 'handle' represents the weak hand selling necessary to remove the last barrier of resistance before the stock or index can power higher. In the SPY example the weak-hand-selling has played out relatively well with accumulation days outscoring distribution days by a clear margin since the start of June (even if overall volume is light because of summer trading). The issue is whether the weak construct of the cup-and-handle has the necessary oomph to fuel buyers on to its projected target of $123+. The critical watch area for bulls is what will happen to $95 support once the SPY makes its next move down. If $95 holds it will add a level of confirmation to the cup-and-handle, but if it breaks it will lengthen the base with the next support level down at $87.50. However, a longer base would revise the upward target to $133 based on a break of $100 resistance, assuming $100 turns out to be the turning point here (give or take a dollar or two). 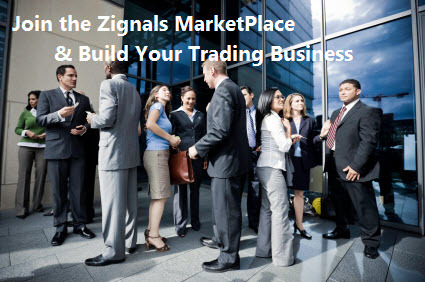 You can use Zignals Market Alerts to mark these SPY price levels: $95, $87.50, $123, $133 so you can make the informed decision when the time comes.